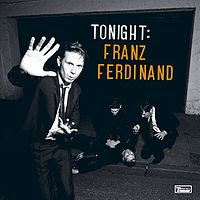 Tonight: Franz Ferdinand however is a record that I’ve shelled out for and therefore see no qualms with putting up my own track by track review here. Overall I think it’s a cracking record from one of the UKs best current bands. There’s a couple of tracks worth of filler which is a shame, but this is more than made up for by the bonus disc of dub mixes. This second disc (entitled Blood) is best listened to after you’ve assimilated the album. Particular highlights are the version of ‘Twilight Omens’ (called ‘Backwards On My Face’) and ‘Feel The Pressure’ (a reworking of ‘What She Came For’). There’s a lot of enjoyment in this disc, listening out for where on the album the song segments come from. The most surprising song on the disc is ‘Vaguest of Feelings’ which comes initially from ‘Live Alone’ but in accentuating the keyboard section propels the song to glacial pop territory. As a package Tonight / Blood is more than just a good album. Rather it demonstrates why Franz Ferdinand are godfathers of modern band-based pop music and how they are kings of all that they survey.